Every tool offers different or improved characteristics against its competitors. On the other hand, advanced solutions come with a steep price. Striking a balance between all the characteristics can pose a challenge. You may need to dig into technical documentation or reviews, which is a complicated and time-consuming task. 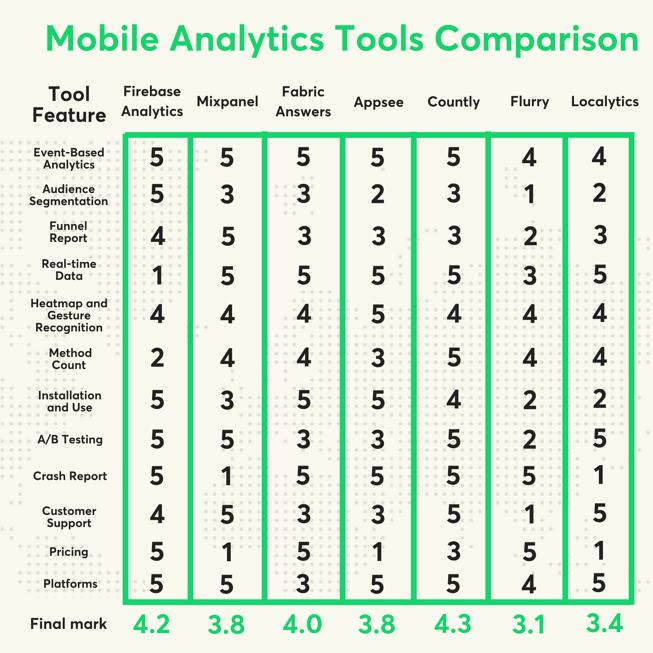 We chose features and compared 7 differents mobile analytics tools to make your life easier. Firebase is Google’s development platform for mobile and the web which counts with several features like analytics (not that you should be surprised), real-time database, cloud messaging, storage and crash report among others. We’ll focus on analytics only. It was founded in 2009 and is based in San Francisco, California. It’s an event-based analytics tool, but it allows us to provide information about users’ engagement, build complex queries according to properties, users’ information and more. It was founded in 2011, acquired by Twitter in 2013, and then by Google at the beginning of 2017. The Fabric suite includes a lot of features like Crashlytics or Beta. It is also based on events, some of which are already pre-defined. Appsee is SaaS platform founded in Tel Aviv in 2012. It offers event-based analytics along with other unique features like touch heatmap and crash reporting videos. Customers of Appsee include companies from a wide range of industries such as travel, news, gaming and real estate. Samsung and eBay are the biggest brands. Countly is an open-source and real-time analytic tool with an option to self-host for free or move to their hosting servers. Similarly to some other tools, Countly offers analytics and many other functionalities for your app. Flurry is Yahoo!’s analytic mobile tool. It was founded in 2005 and acquired in 2014. Back in the time, Flurry merged with a company called Pinch Media and had more than 80% of the market share for mobile analytics. 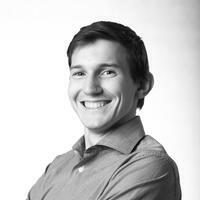 Localytics was conceived in 2009 in Boston, Massachusetts. Lots of the best-known brands use or used this tool. You can find companies such as New York Times, Salesforce.com and Microsoft in their portfolio. Currently, it supports more than 6,000 customers and reaches 37,000 apps coupled with 2.7 billion devices. Download the table with all the specs. All the tools allow event-based analytics. The main difference is that Firebase Analytics and AppSee log some events automatically, which is a nice-to-have function. Other tools don’t offer this option and impose some limits in the number of events we can define. Audience segmentation is also available in all the tools, but in some cases there are restrictions. For instance, with Flurry you can create only 10 segments, whereas Fabric Answers offers an unlimited number of filters. On top of that, it’s a complicated procedure to define the segments in most of the tools. Firebase Analytics stands out with a useful feature: it creates a new segment after every crash. One of the most important features to see users’ engagement is the Funnel Report, as it shows how your efforts at different stages of customer journey translate into conversion. All the tools provide this kind of data, but only Mixpanel gives you retroactive funnels with statistics from the previous days. Out of all the mentioned tools, only Firebase Analytics collects and displays data with a delay of several hours. Other platforms allow you to see and interact with them in real-time. AppSee offers one really interesting feature that other tools lack. It shows a Heatmap and Gesture Recognition on the screens and enables fixing the UI according to its results. When speaking about A/B testing, the best options are Firebase and Mixpanel. They make a feature or style comparison very easy. Some platforms also offer crash reports and integrate them with the analytics. For instance, Firebase Analytics and Fabric create new segments for every bug. As for the budget, Firebase Analytics, Flurry and Fabric Answers are free. However, you won’t own the data. Countly, as an open source, gives you the possibility to self-host your app. One thing to remember is that free tools have poorer customer support. If it’s an important factor, you should consider paid options such as Mixpanel. All of the tools can be used in Android and iOS. Some of them support other platforms as well. There is no clear winner, as all of the tools offer different possibilities and, obviously, prices differ as well. Depending on your budget and needs, you should weigh up the options you have and make a decision yourself. Download our little cheat sheet with a comprehensive handout of all the tools to make the right choice.